I had been having my Spiced Oat Bran Porridge with Grated Carrot and Zucchini for weeks for breakfast when I felt I needed some change. So, I started to think about the colour the porridge could be and somehow red popped into my mind immediately. 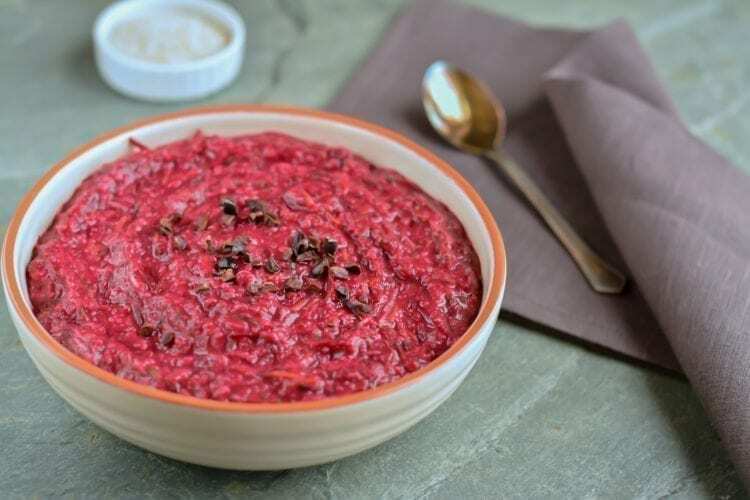 Now, there are not many options to achieve red porridge, so I bought some organic beetroots and started experimenting with the quantities and spices. 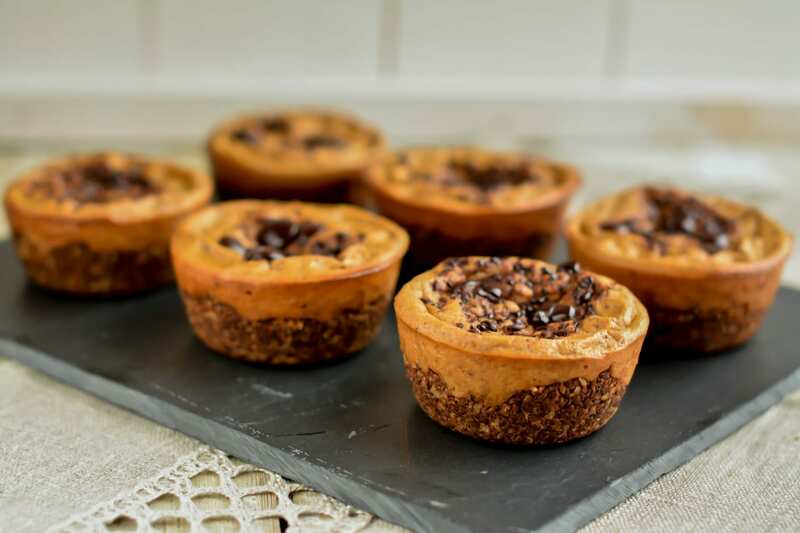 During the first attempts I used too many spices and too much carob. I mean, the porridge was totally edible, but I knew I had to play with it some more to get the taste right. After a few more tries, the winners were cinnamon, cloves, ginger and black pepper. 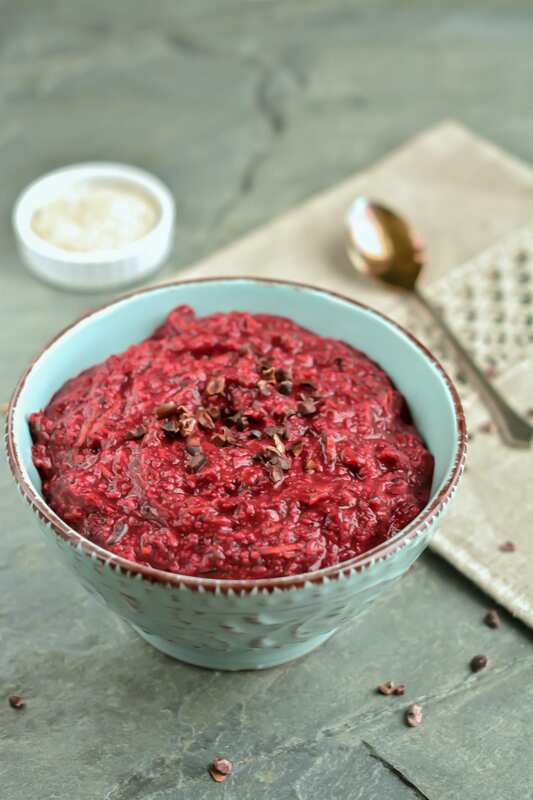 My chocolaty beet porridge is not as spicy as the carrot-zucchini oat bran porridge, but only with a hint of ginger making it suitable also for those who prefer milder flavours. I feel that my menu is very rich now that I have introduced starchy veggies back into my diet – all thanks to this thorough book about how to get rid of yeast infection that I found online. 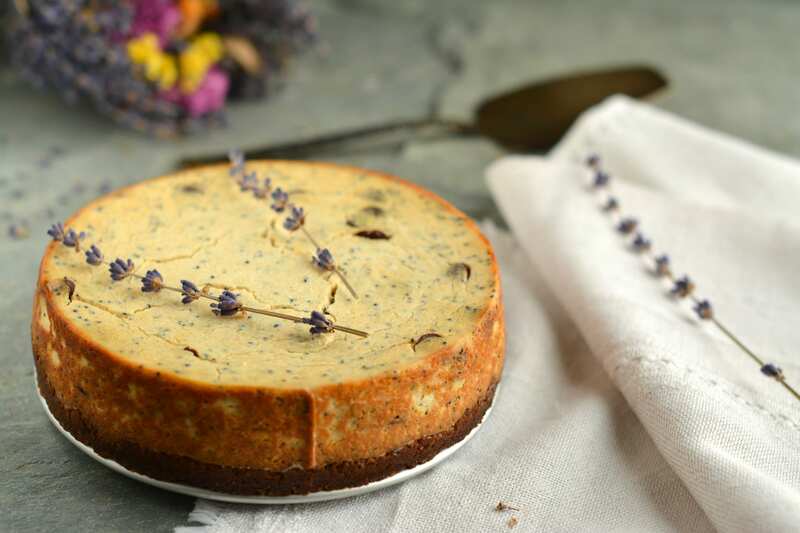 I know that I still owe you a revised post on vegan candida diet meal planning. I’m on it, I promise! 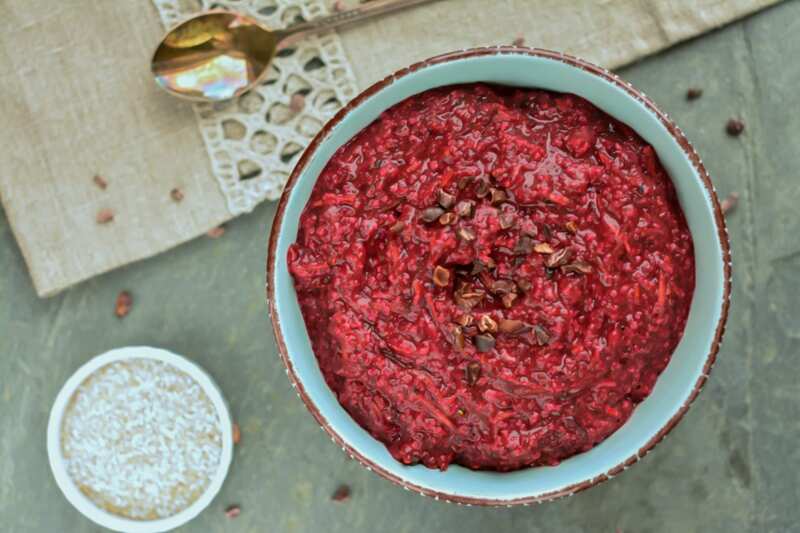 Back to the beet porridge – it’s vegan, plant-based, Candida diet friendly, oil-free, refined sugar free, dairy-free and gluten-free (for those who can tolerate avenin in oat bran). I’m also super glad to see this porridge living its own life – Sophie from Philosophie Made liked it so much that she created her own version! Bring water to boil and whisk in oat bran. Simmer for 3 minutes whisking every now and then. Add plant-based milk and simmer for another 2 minutes. Cover with lid and set aside. Finely grate carrot, beet and summer squash. Add all the spices, salt, sweetener and pepper to the porridge. Mix well and taste. Remember that veggies will smooth some of the taste out. Mix in grated veggies. Keep mixing until all the ingredients are well incorporated. I use either non-GMO soy, almond, hazelnut or quinoa-rice milk, but you are free to use any plant-based milk you like. I just recommend buying only milks without any artificial additives (sugar, syrups, preservatives). I’d sometimes make an exception for agave syrup if I weren’t on Candida diet. You can play with carrot-beet ratio – put half and half for example. If you put more beet, the porridge will have more intense colour. I use 12-15 stevia drops to sweeten my porridge, but you can choose a sweetener of your choice – if you are on Candida diet, then another option would be xylitol, if not, go for some date paste or other dried fruits or even a dash of honey or agave syrup. You can also prepare your porridge with naturally sweet plant-based milk (oat or rice) omitting the water and you wouldn’t even need any sweetener.